Who are the Pasta Kidz & their Petz? The Pasta Kidz are magical, fun and unique characters fashioned out of different types of Pasta noodles, each with their own Pasta Pet. 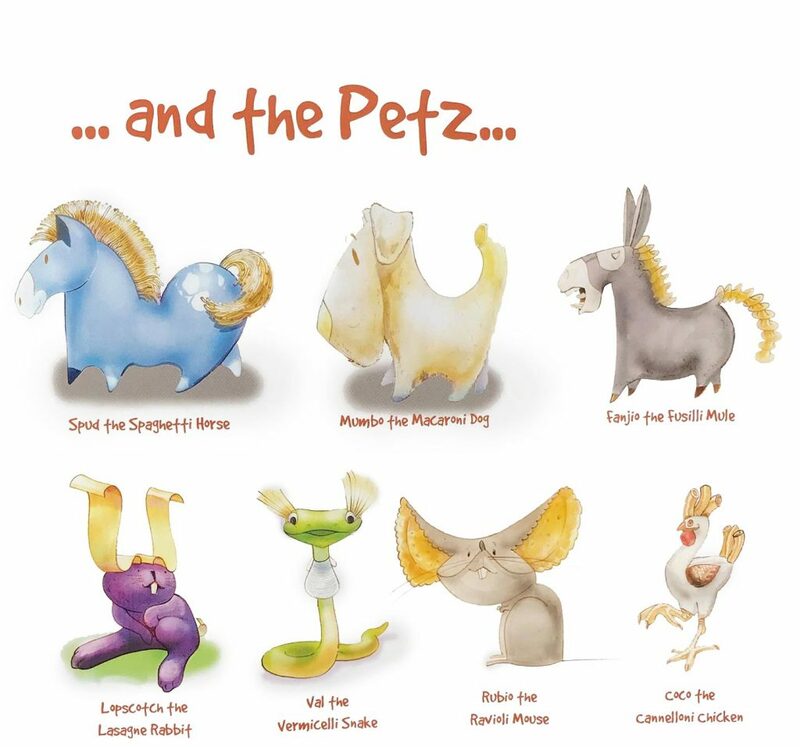 In the last review we featured pictures of the Kidz, this review we chose to show you their Petz! We love how The Kidz & Petz have a unique vocabulary that make reading the book so much fun! The play-on-words keep young minds entertained from beginning to end. The Pasta Kidz and Petz are such lovable characters and their unique language are fun and engaging to young readers. What’s The Sorry Sticks About? 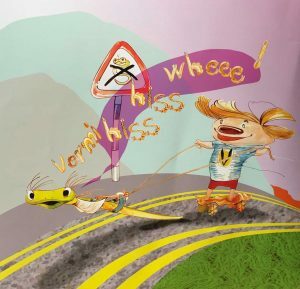 The story begins with Pet, Val the Vermicelli Snake, and his owner Victor caught speeding by the Big Ticket in the ‘No Snake Lane’. The pair must show the Big Ticket how sorry they are for speeding. The Sorry Sticks story is filled with unique vocabulary, rhyming words and action packed fun. We love how every book there is a moral lesson to be discovered. 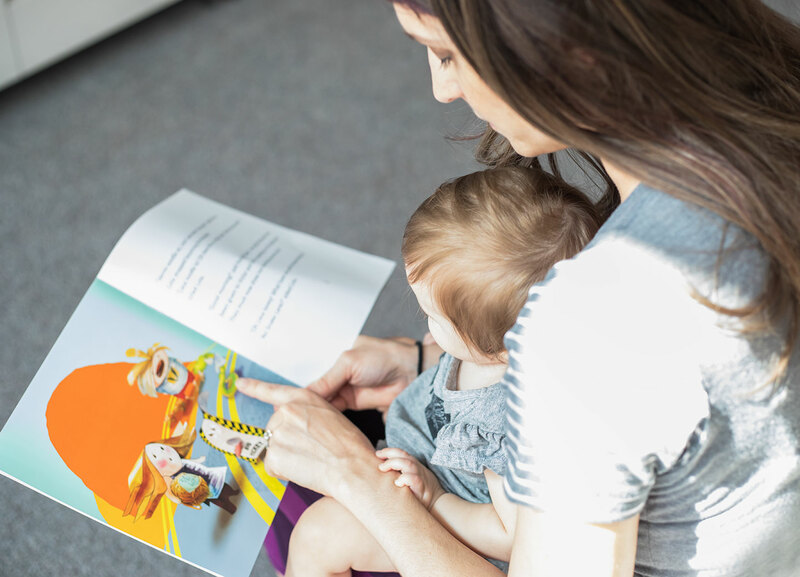 The story helps children understand the importance of apologizing when wrongdoing and even how to come up with creative ways to say sorry. The Pasta Kidz series are geared for children ages 4-7. With a total of 16 reading pages, the book keeps young readers engaged with its colorful pictures, creativity and imagination. The characters have a unique vocabulary that make the book fun and interesting to read. At the back of the book is a glossary of all the vocabulary used throughout the story, just for reference. The theme throughout the second story is predominantly about understanding to apologize when wrongdoing, friendship, and forgiveness. Thus emphasizing the importance of following directions. Although the book is written for older children, my daughter under 1 years old, loves looking at the vibrant and colorful pictures! She loves when I sing the rhyming words to her. We love the creativity of the characters fashioned out of pasta noodles and their funny names. It has been helpful in teaching my baby the different noodles! The silly sticks have the funniest personalities bumping into each other and apologizing – my daughter would giggle every time I read that part! I particularly loved, as a mother, the effort in making sure that Victor had on a safety helmet when riding his Pastaboard. I think it’s so important for children to visually see their favorite characters exercising safety! We really enjoyed the second book, and are grateful to Bryony for introducing us to her adorable and zany characters. We look forward to the release of further books in The Pasta Kidz series! YOU CAN FIND OUT MORE ABOUT THE PASTA KIDZ ON THEIR WEBSITE. 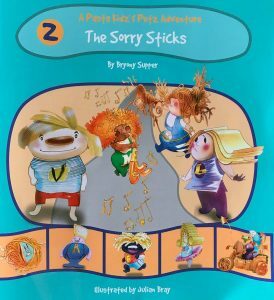 Disclaimer: I was provided with a free copy of The Pasta Kidz – The Sorry Sticks in exchange for an honest review on my blog. All photos are copyright to either MommaReview.com or The Pasta Kidz brand. All views in this review are 100% my own. This page contains affiliate links.